The soft, repetitive clink of Agnes’s metal necklace caught Jim’s attention. She was fidgeting again. “Not much longer now,” his voice echoed. He barely made out the forms of Agnes and Trish where they crouched in the shipping crate. “Seems so,” Jim answered. Outside the crate, the heavy footsteps of a passerby grew louder, then stopped outside. Trish drew her gun. A large crack broke the silence as the front of the crate fell away. Trish leapt forward, shoving her gun between the ribs of whoever had discovered them. “Whoa, now,” came a rough, familiar voice. 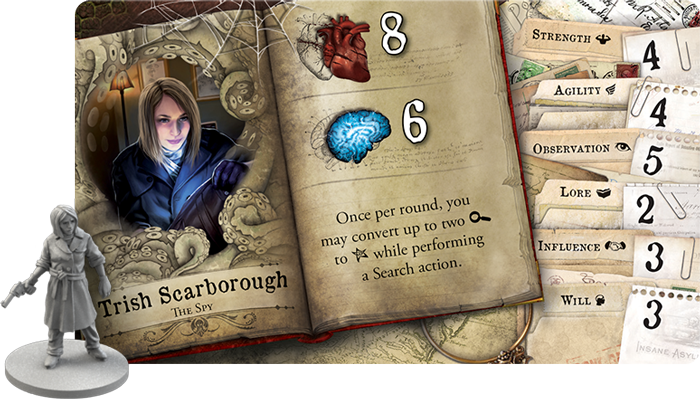 Today, we're pleased to introduce you to the four investigators who will be joining your team in the Horrific Journeys expansion for Mansions of Madness—now available for pre-order at your local retailer or online through our website! Silas Marsh has loved the sea ever since he was old enough to toddle through its briny shallows. Becoming a sailor was the easiest decision he ever made, and his sturdy frame and good sense for the weather gave him a strong reputation aboard any vessel. There was only one thing troubling Silas: over and over again, he dreamed of unsettling cities hidden beneath the waves, populated by monstrous creatures. These dreams call to him, stirring something deep inside that he thought he had left behind in Innsmouth. As a steadfast sailor, Silas is used to working as part of a team, pushing himself forward even when no one else thinks they can continue. 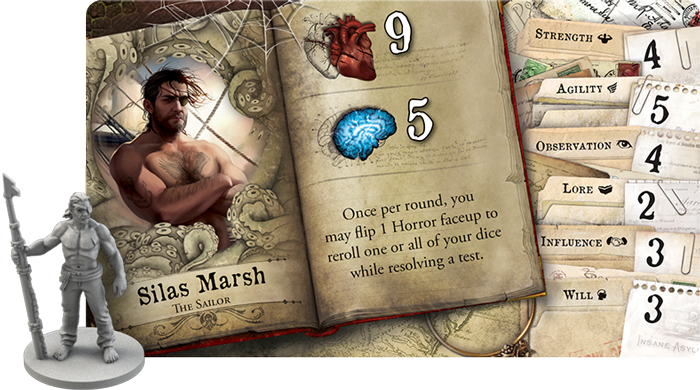 Once per round, Silas may flip one horror faceup to reroll one or all of his dice during a test! This ability asks Silas to take a grave risk upon himself as he only has five sanity, but if he has the chance to move the investigation forward or save one of his companions, it is a risk he will happily take. Agnes Baker had lived an uneventful life as a waitress at Velma’s diner until the day she found a strange old key among her old family belongings in the attic. When her fingers brushed against the cold metal, memories of a previous life flooded her mind. The woman who would become Agnes had been a powerful sorceress, well-versed in spell casting and all manner of arcane lore. The more Agnes explored these memories, the more she found she could tap into her past lives’ abilities, even performing magical feats herself. As Agnes’s power grows, she is becoming obsessed with one word from these memories that appears over and over again: “Hyperborea,” the key to her legacy. 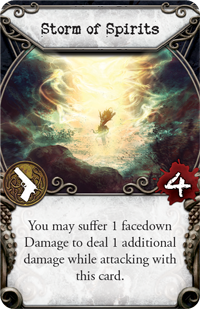 Agnes begins the game with the Storm of Spirits spell—a powerful offensive spell, which she can amplify by suffering damage herself. This may be an incredible weapon, fitting for one who was once a high-ranking sorceress, but all magic comes with a price. Each copy of Storm of Spirits is double-sided, and there is no telling what the cost of this power will be. 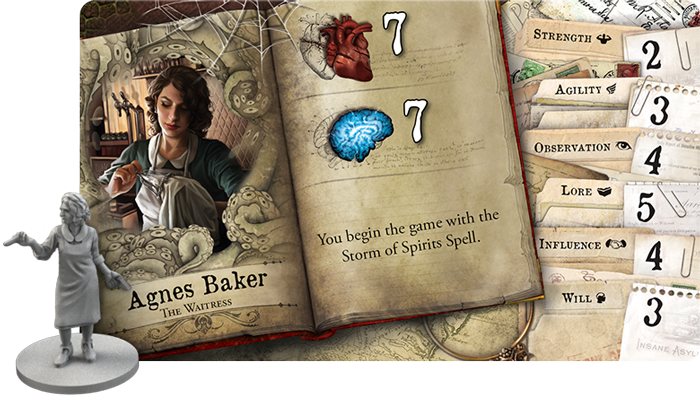 As Agnes is relatively new to her craft, she may end up hurting herself or even one of her teammates. But Agnes has chosen to use her gifts to defend humanity from the monsters of the beyond, and she will not abandon the innocent in their hour of need. 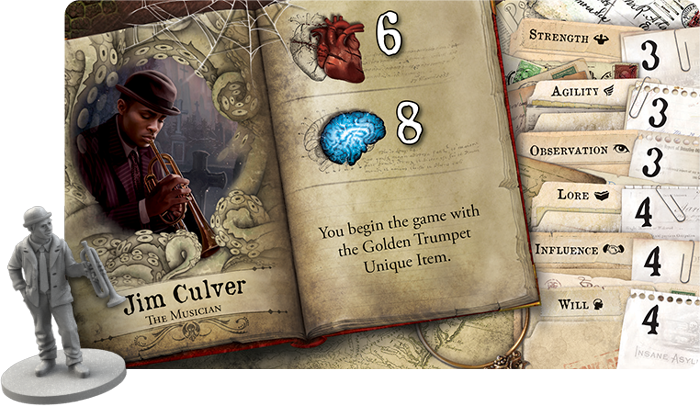 Jim Culver inherited his father’s trumpet willingly, but he could not have known what was to come. When he played it, he found that the music brought comfort not only to the souls of the living, but to the souls of the dead as well. For long after the last notes of his melody faded on the wind, the spirits of those who had passed away would linger around him. It turned out that once folks found a listening ear, they had an awful lot to say. These conversations used to bother Jim, but his new friends know much, so he has learned to appreciate the company. As Jim gains more lively friends in Horrific Journeys, he can use his gift to ease the troubled minds of his companions. He begins each game with his treasured Golden Trumpet. 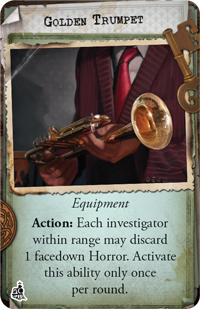 This magical instrument gives the chance, once per round, to heal one facedown horror from each investigator within range. 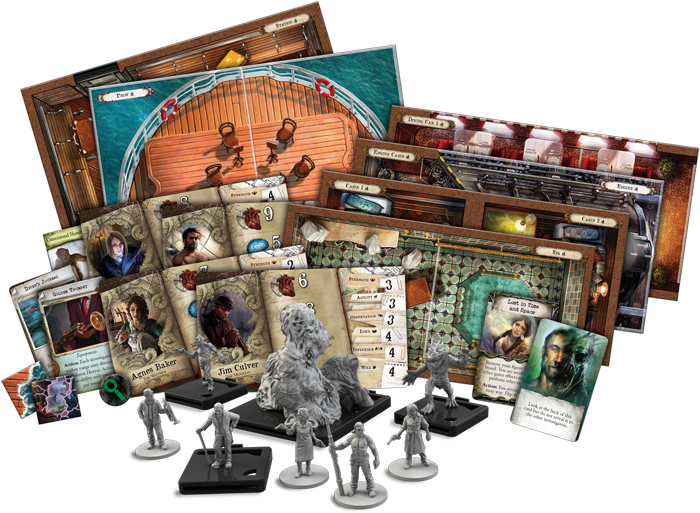 While Jim himself has an impressive eight sanity, Mansions of Madness challenges players to become part of a team, and although Jim could still commune with them, he would prefer to keep his allies on this side of the grave. Trish Scarborough always excelled in matters of both body and mind. Her unwavering focus on excellence and fearless disposition made a winning combination. With both stellar academic and athletic records, everyone expected her to become something great. Instead, Trish took a job at a commercial code company. The initial shock of her humble work eventually wore off, and the exceptional Trish Scarborough faded into obscurity. This suited Trish just fine—in fact it was all part of the plan. Appearing completely ordinary keeps others from digging into her secrets and discovering the truth about her real work with the Black Chamber, the Bureau’s code-breaking agency. As a spy, Trish travels across the globe, trading on information better left undiscovered. Where most investigators must depend on clues, Trish has years of experience and hard-earned skills to lean upon. Once per round, Trish may convert up to two clue icons on her dice to successes while performing a search action. With unmatched observational skills and good strength and agility, you'll want to have Trish on your side when time is running out on a racing train or a sinking ship. The roads that lead to Arkham become more dangerous every day, and soon, your home will fall before the forces of darkness unless you can put a stop to it. 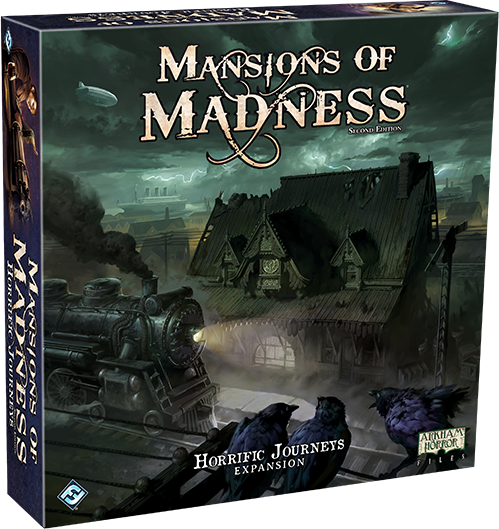 Join Arkham’s newest recruits, leave the city behind, and discover the terrors that await on your Horrific Journeys! Pre-order your copy of Horrific Journeys (MAD27) at your local retailer today or on the Fantasy Flight Games website here!